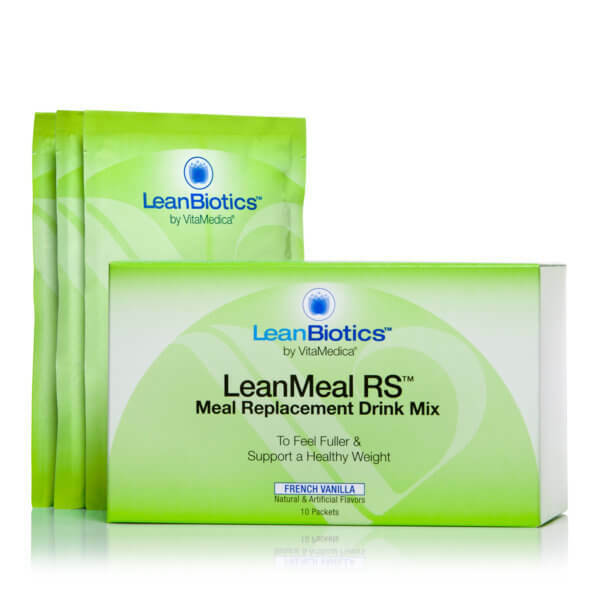 Each Healthy Weight Starter Kit includes a LeanBiotics® Cleanse and a LeanBiotics® Probiotic supplement plus 14 packets of LeanMeal RS Meal Replacement Drink Mix. 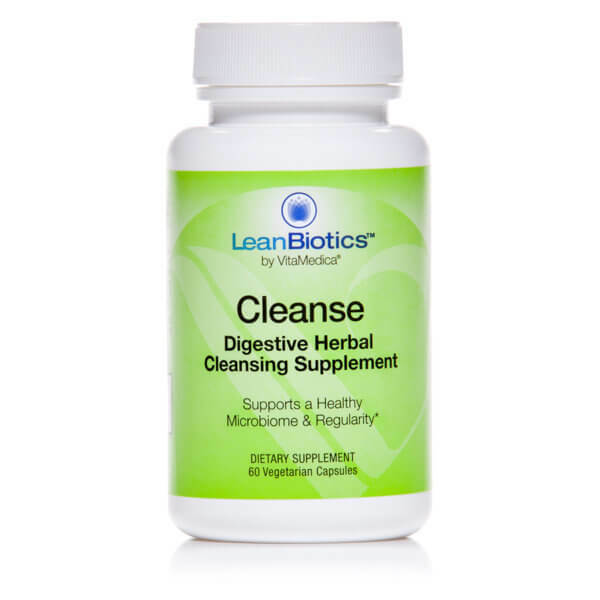 LeanBiotics® Cleanse Directions: For fourteen days, take 2 LeanBiotics® Cleanse capsules with 8-ounces of water in the morning and in the evening. LeanBiotics® Probiotic Directions: For fourteen days, take 2 LeanBiotics® Probiotic pearls a day with or without food. Our time- released technology will deliver beneficial species throughout the day. 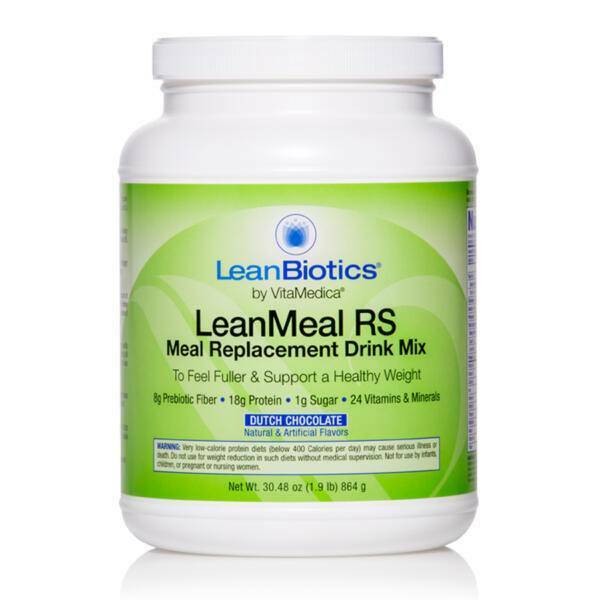 LeanBiotics® LeanMeal RS Directions: For fourteen days, substitute one meal a day with LeanBiotics® LeanMeal RS. Combine one packet with 8 fl oz of cold water, almond milk, soy milk or low-fat milk and mix thoroughly. WARNING: Do not take if safety seal on bottle is broken. KEEP OUT OF REACH OF CHILDREN. If you are diabetic, pregnant or breast-feeding, seek advice of your physician before using this product. When first taking PROBIOTIC, you may experience slight GI upset. This is normal and should disappear within a few days. 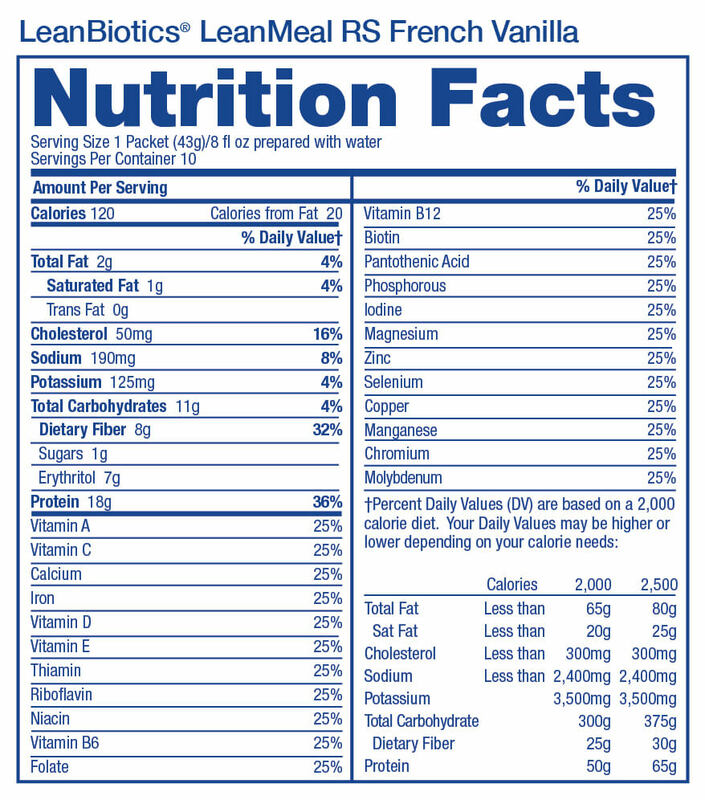 Each individual is unique and nutritional requirements may vary. 1. What is the primary benefit of using LeanBiotics? LeanBiotics Healthy Weight Starter Kit provides a comprehensive approach to healthy weight loss and weight maintenance through nutritional supplements that cleanse, replenish, and nourish the gut microbiome, plus physician-guided advice on the best foods and exercise to support a healthy weight. 2. What makes VitaMedica’s LeanBiotics unique? LeanBiotics is the first weight management plan that is designed to support a healthy weight by modifying the gut microbiome. 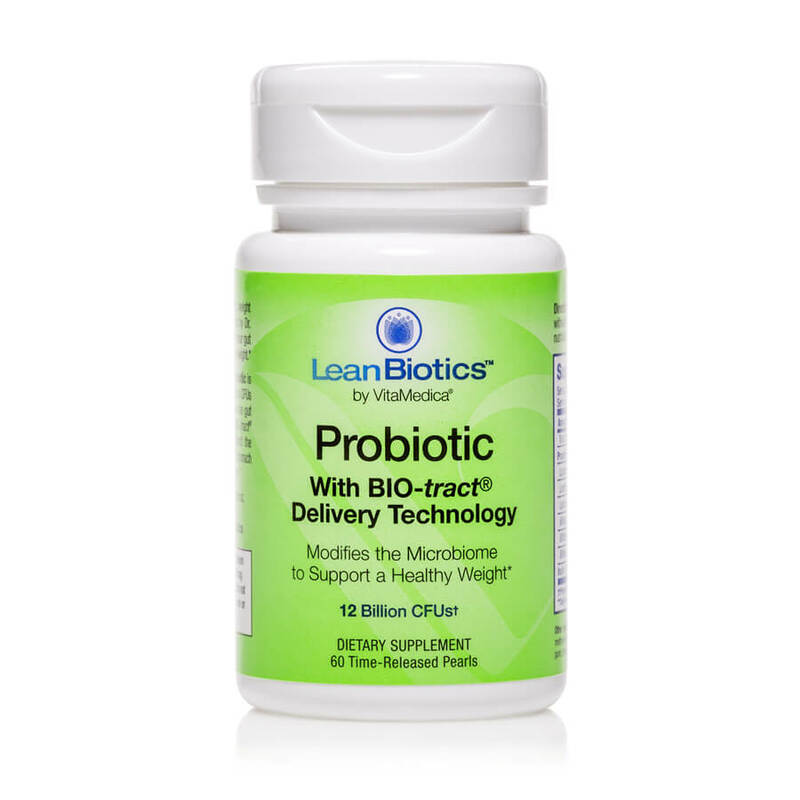 Backed by evidence-based science and using pharmaceutical-grade formulations to ensure quality, LeanBiotics was created by Dr. David H. Rahm as a revolutionary and innovative approach to healthy, sustainable weight management. 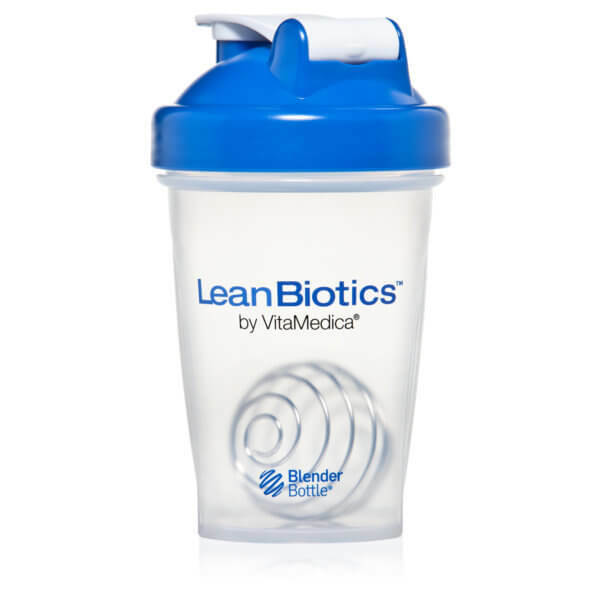 3. Who should use LeanBiotics Healthy Weight Starter Kit? Anyone who is looking to attain and sustain a healthy weight over the long-term can benefit from LeanBiotics Healthy Weight Starter Kit. An imbalanced microbiome dooms any diet to failure because gut bacteria regulate metabolism, appetite, and cravings. LeanBiotics Healthy Weight Starter Kit is designed to provide the tools, support, and educational guidance every step of the way to help you reach a healthy weight and maintain it. Unlike other weight management programs that require eating special foods, counting points, or depriving yourself to force weight loss at the expense of your health, LeanBiotics first promotes health and second promotes weight loss. The emphasis is on the quality of your diet and exercise. 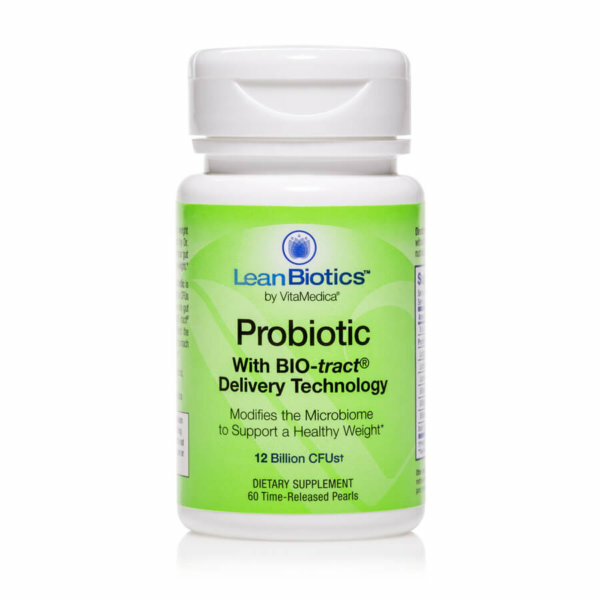 4. Who should not use LeanBiotics Healthy Weight Starter Kit? 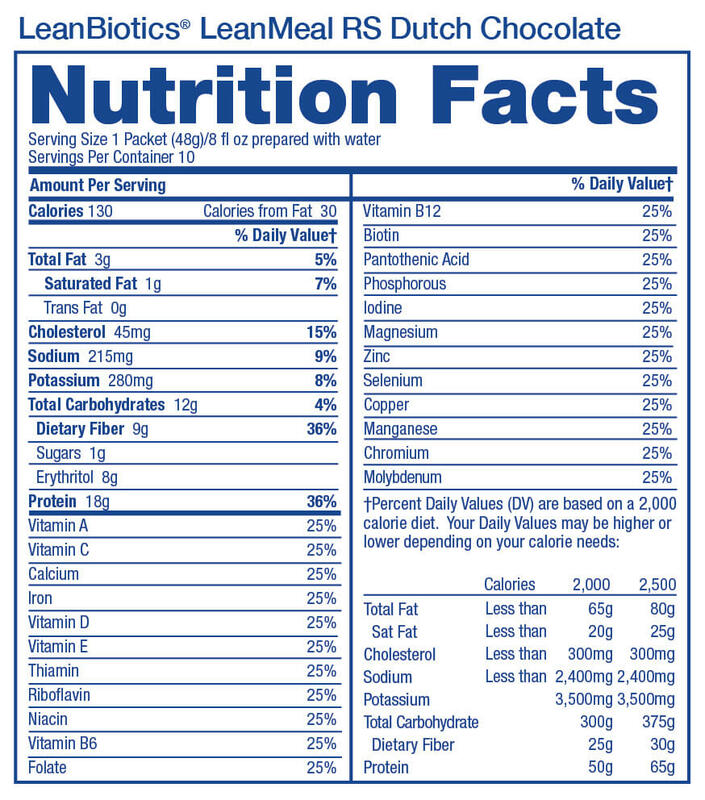 Nutritional supplements have an excellent safety track record. However, certain individuals should seek the advice of their doctor before beginning a weight loss program, particularly diabetics and pregnant or lactating women. Please refer to the Directions section on each product label for more information on warnings and contraindications. 5. Is LeanBiotics only for women? No. Any adult over 18 who is looking for healthy weight loss or weight management solutions can benefit from taking LeanBiotics. 6. Can I take LeanBiotics Healthy Weight Starter Kit in conjunction with other weight loss supplements? 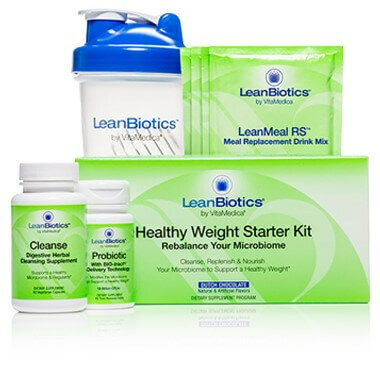 LeanBiotics Healthy Weight Starter Kit is a patent-pending, comprehensive weight management program that involves making dietary and lifestyle changes along with using three nutritional supplements that are designed to work together. No other weight management supplements should be taken while using LeanBiotics. 7. What is the microbiome? In biology, a biome is a self-contained ecosystem, where all the organisms can interact with each other and the environment in which they live. Smaller biomes are typically called microbiomes. The human body contains trillions of cells that are not human but microbial. Like human cells, these microbes have genes which instruct cell activity. This massive microbial community that inhabits the body and their collection of genes is called the human microbiome. A human has about 23,000 genes, but the microbiome has around 8 million genes. Given these numbers, it’s easy to see why the microbiome is often referred to as the second genome. The bacterial cells in your microbiome outnumber human cells in your body by a factor of 10. And these bacteria are incredibly diverse – over 400 species belonging to different families. We now recognize the significant effects the microbiome can have on our health. 8. What role does the microbiome play in weight management? Research conducted over the past 10 years has shown that the diversity of gut bacteria and their efficiency in extracting energy (or calories) influences whether an individual is more likely to be lean or obese. Bacteria help us to digest food, and some bacteria are more efficient at doing this than others. These bacteria extract more energy (calories) from the foods we eat, and this excess energy is then stored as fat. People with large and diverse bacterial populations in their digestive tract tend to be less prone to obesity, immune problems, and other health issues than people with low microbial diversity. Researchers believe that the gut microbes may sway our food choices by influencing cravings in our brain via the vagus nerve. Creating a bi-directional connection also referred to as the “gut-brain axis”, the vagus nerve runs all the way through the spinal column from the brain to the gut, where ¾ of the body’s neurotransmitters are produced. A well-known example of this is serotonin, the hormone that affects mood and appetite, among other things, 80-90% of which comes directly from the gut. By altering neural signals, changing taste receptors, producing toxins to make us feel bad, and releasing chemical rewards to make us feel good, the microbes in our gut effectively manipulate our mood and eating behavior. 9. How do I spot a fad diet? What makes LeanBiotics Healthy Weight Starter Kit different? Fad diets are those that promise quick and dramatic weight loss without having to make any dietary or lifestyle changes, eliminate one or more food groups, oversimplify complex research or worse, make recommendations based on biased research conducted by parties with a personal stake in selling the weight loss product in question. 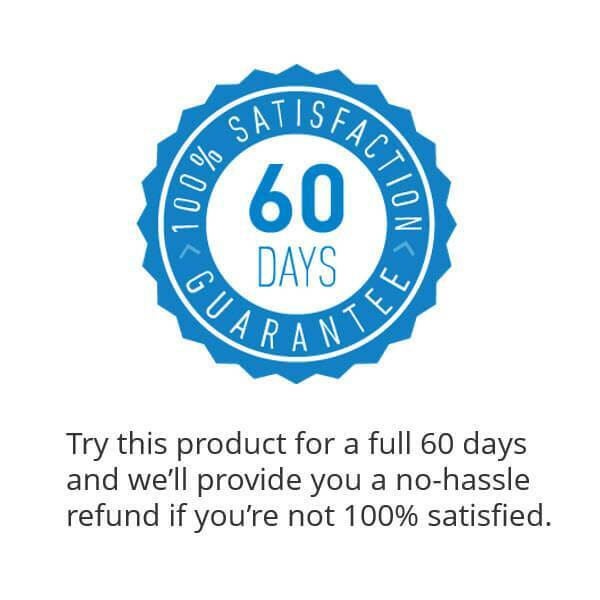 If their claims sound too good to be true, it’s because they are. Rather than make outlandish claims or promote unhealthy extremes, physician-formulated LeanBiotics Healthy Weight Starter Kit uses a moderate, common sense approach to healthy weight loss through a combination of specific supplements, dietary guidelines, and healthy lifestyle changes to improve both your weight and your overall quality of life. 10. Will I feel hungry or restricted on LeanBiotics Healthy Weight Starter Kit? Unlike many other diets, with the LeanBiotics Healthy Weight Starter Kit, you won’t have to count calories, measure foods or track points. By following our common-sense guidelines, you will naturally reduce your caloric intake, have better control of your appetite and cravings, won’t feel as hungry between meals and ultimately, better manage your weight. You’ll naturally increase your fiber and protein intake which studies show aids in weight loss, while still providing a feeling of satisfaction and fullness. Furthermore, these effects last longer compared to eating refined, simple carbohydrates and sugars, so you’ll be less inclined to reach for unhealthy snacks in between meals. 11. Can I skip meals while on LeanBiotics Healthy Weight Starter Kit? It is not recommended to skip any meals while following LeanBiotics Healthy Weight Starter Kit, or at any other time for that matter. Skipping meals deprives your body of the essential nutrients it needs to function. Plus, if you go for long periods of time without any fuel, you’re more likely to compensate by overeating at your next meal. Instead, it’s better to eat smaller, more frequent, high-quality meals throughout the day. 12. If I want to lose weight do I have to stay on LeanBiotics until I reach my goal? When your objective is weight loss, it makes sense to stick to a plan that is working at least until you reach your goal. Even if you are no longer using the LeanBiotics products it is recommended to continue following the program’s dietary and exercise guidelines to support not only continued weight loss but a long-lasting healthy lifestyle. 13. About how quickly will LeanBiotics start to change my gut health? Both animal and human studies have demonstrated that what is eaten can influence the microbiome. Microbes evolve so quickly (their average life expectancy is about 20 minutes), that their genetic composition can change rapidly – in as little as 24 hours. This allows the bacterium to adapt quickly to changes in the environment. Even if you’ve been splurging on junk food for years or your intentions to eat healthy get sidelined on the weekend, the good news is that with a healthy diet and LeanBiotics you can begin to restore your microbiome within a matter of days. 14. What’s a realistic weight goal? A realistic, healthy weight goal will heavily depend upon each individual, their age, health conditions, and current weight, as well as lifestyle factors such as the amount of sleep they get and daily stress levels. Given that most Americans are either overweight or obese, even moderate weight loss is beneficial for most people. On average, a 5% to 10% decrease in weight can result in significant improvements to overall health and wellness. 15. What’s the difference between weight loss and weight maintenance? Weight loss implies that you are actively trying to lose weight, while weight maintenance or weight management refers to sustaining a healthy weight once it has been reached. In order to lose weight, it is necessary to alter the habits that have led to weight gain or have prevented weight loss attempts in the past. It is important, however, that changes are not so extreme that they are unsustainable as this will almost always result in gaining back all and possibly more weight than you started with. If you’ve tried fad diets in the past or describe yourself as a “yo-yo” dieter, you’re already familiar with how devastating this can be to your physical and mental health. The key to healthy weight loss is making small, strategic changes that are sustainable, so you can stick with them for the several weeks or months it may take to reach your goal. Once you have reached your healthy weight goal, you want to maintain it by practicing mindful eating, leading an active lifestyle and getting adequate sleep. A busy lifestyle, busy social calendar, and the messy realities of life mean it’s impractical to restrict your diet 100% of the time. The 80/20 Rule is a practical approach that recommends you eat healthfully 80% of the time and allow yourself to indulge 20% of the time. For example, if you have plans to eat out with friends over the weekend, you can modify your midweek eating accordingly and still maintain a healthy weight. By achieving a balance between healthy foods and indulgences, you’re more likely to make a long-term lifestyle change and achieve long-term success. LeanBiotics Healthy Weight Starter Kit provides the flexibility to guide you through an initial phase of weight loss if that is part of your goal, as well as over the long-term with tweaks to your diet and lifestyle that set you up for successfully maintaining your newfound healthy weight. 16. About how quickly will I see results for weight loss? As with anything involving the question of weight, the amount of weight you can expect to lose and how long it will take to see results is highly individualized. By faithfully adhering to the product regimen and guidelines laid out in LeanBiotics Healthy Weight Starter Kit most people can expect to see some weight loss within 2-4 weeks. The key to maintaining any weight loss is to use a slow and steady approach, making small, strategic and sustainable lifestyle changes that add up over time. Keep in mind the fact that muscle mass weighs more than fat mass. The additional muscle mass you will likely build through increased exercise may throw off your ideal number on a scale, yet your overall physique will have improved. By taking your initial body measurements and comparing them over the course of several months, you will be pleasantly surprised at your progress.